-Now you can upgrade your trusty 12 Gauge Remington ® 870 to accept a modern sight system and tactical flashlights. With a red-dot sight or pistol/scout scope, you can get the most out of your favorite tight choked turkey gun or slug barrel. -This rugged aluminum mount bolts onto the 870 barrel in minutes with NO modifications to the gun! -Works with all fore end styles and allows you to change barrels on your shotgun without losing the zero on your sighting system. Good for left-hand and right-hand shooters. 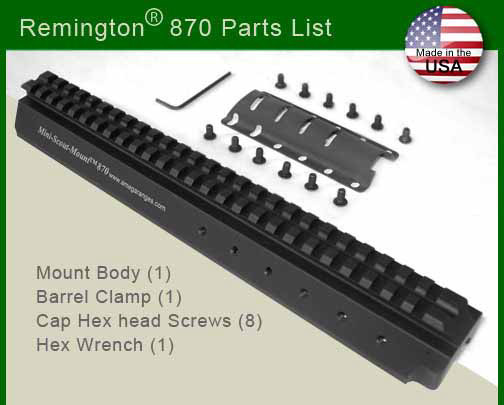 -The Vent Rib model will fit all of the Remington ® manufactured vent ribbed 12 gauge barrels. 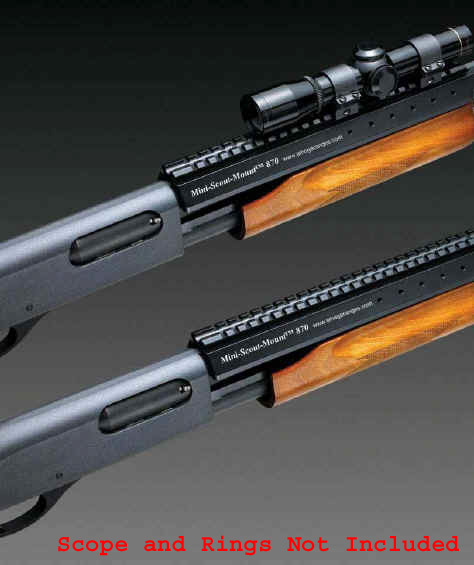 Our 870 mount WILL fit the 870-Super Express Magnum (3 1/2" shell) just like all of the other 870 12ga barrels.